When you have a widescreen, with a resolution of 1920x1080 or higher or a bit lower, in Windows Vista, 7, 8 and 8.1 you would put your DPI scaling to 125% or higher to make text and images appear larger and more easy to read. But when you put the DPI scaling to 125% in Windows 10, you see in a lot of dialogs and windows the font gets very blurry. 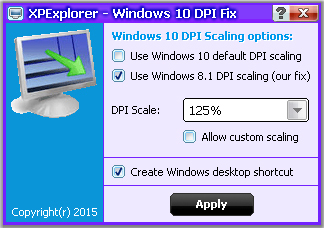 It does not matter if you are using the regular or custom Windows DPI scaling functions at your 'Screen properties'. Text will get blurry on 125%. You can test if you have this bug also if you put your DPI scaling to 125% at your 'Screen properties', then reboot Windows (or sign in again when it asks you). Then goto 'Control panel > Administrative tools > Services'. If you have this issue also you would see the titlebar of the Services window has a font scaled good. But the services list itself is very blurry/unsharp to read. Right-click on the shortcut to your application that has blurry fonts, then select 'Properties'. Then tab 'Compatibility'. Then enable 'Disable display scaling on high DPI settings' and hit 'Apply'. then restart your application, and you see it will look good. Windows 10 is using another scaling method for DPI as in Windows Vista, 7, 8 and 8.1. At some point we can understand Windows why they changed the DPI scaling in Windows 10. It is probably ment to support mobile devices more easy. But if you like to use your Desktop as a Desktop, and you demand high quality only. Then you can use this fix until Microsoft has addressed this issue. This fix simple tells Windows 10 to use the original DPI scaling as it was in Windows Vista, 7, 8 and 8.1. Why this is a small software program, and not some 'Registry Tweak' is because when you manually adjust the DPI settings at your 'Windows Registry'. Windows will reset your dpi settings every 2 reboots. Which means you would have to adjust the registry again (Microsoft forces you almost to use its new DPI scaling method). You could use a batch file for it that starts when you start Windows(r) to change the registry DPI settings, but then a ugly CMD box would show if you turn on your computer. This method we created simple works, does what you want. And will not show a ugly CMD box because its using pure API. - It needs to start when Windows starts, but only for a couple milliseconds (you will not see it afcourse). Then it will adjust the DPI scaling to use the Windows 8 way. And then it will close itself. - In Microsoft Edge (its new browser) some Adobe Flash objects will appear smaller, but you can simple overcome that by using Internet Explorer 11, or Chrome, or FireFox. 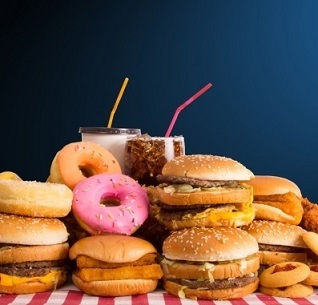 1,854 5,353 Michiel Schermer <img src="http://www.oldergeeks.com/downloads/gallery/thumbs/Windows 10 DPI Fix1_th.png"border="0"> Oct 06, 2015 - 11:49 2.1 1.08MB EXE , out of 12 Votes.